Mural Techniques: Faux Finishing and Landscapes Online Course Is Live! I am so happy to announce that my latest online painting course titled “Mural Techniques: Faux Finishing and Landscapes” has officially launched and the entire course is now available! 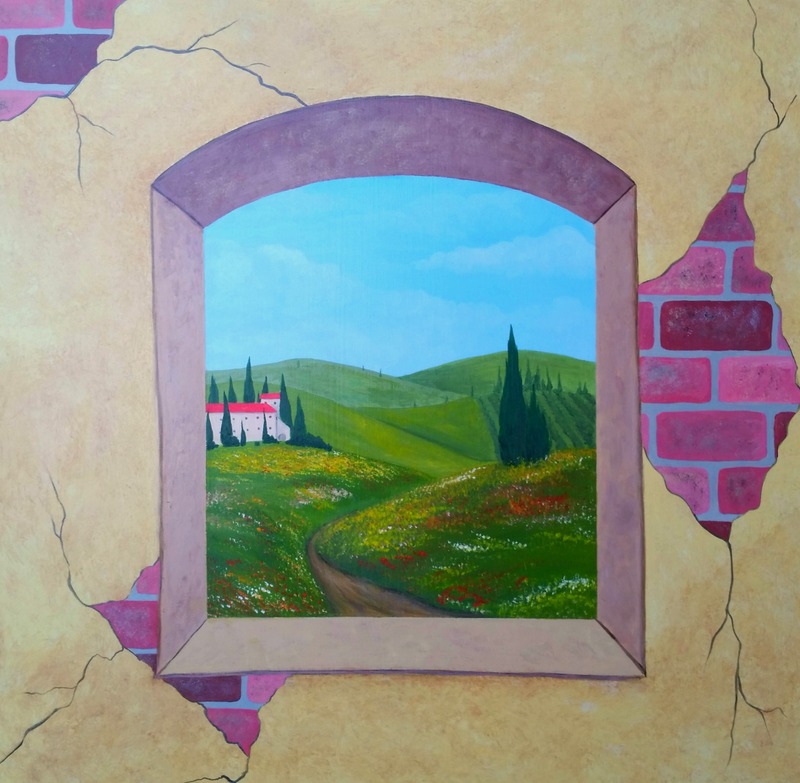 This course is an in depth, step by step process that you can follow along with me to create this gorgeous Tuscan mural scene as either a framed painting or large wall mural. I have been teaching art to adults and children for over 14 years and I am confident that anyone can successfully take this online course. My step-by-step method is broken down into simple, easy to follow steps so that anyone, even a child, can follow along without feeling lost or overwhelmed. Art is so beneficial to our lives and our well being much like physical exercise. According to a study published in the American Journal of Public Health, “There are both physical and mental benefits of creating art.” In analyzing more than 100 studies, many health benefits from creating art were found such as reducing stress, anxiety, and depression, and an increase in positive emotions, identity and social networks. As an adult, I continue to make a special effort to set aside a piece of time each day or even just once a week to make art. I do this so that I can let my mind relax. Art provides me with a sense of escape from the daily stress that work and other outside factors can bring into my life. This course was made with two things in mind; convenience and creativity. Many times we stop trying to pursue our dreams to learn a new skill or trade because there is never enough time in the day or we think it is too late in life to start something new. The wonderful thing about this online course is that it is tailored specifically for you so that you can log in from anywhere at any time, day or night, and work on your painting project at your own pace. Do you have children at home? Is your schedule erratic or does it transition often? No problem. You can start and stop each section or rewind and review any step at any time if you need to step away. So not only are you learning a new skill that you can be proud of, you are also doing something good for your mind and body. I encourage you to take a chance on yourself because you do have the makings of an artist already inside of you. What I have learned through the years as an art instructor is that an adult is more afraid to try art than a child is. I have seen every one of my students, both young and old, succeed in making beautiful paintings and you can too. Art only seems complicated until someone is able to break it down you for you into its simple forms and techniques. After you learn these “secrets” your talent will begin to increase at a very quick pace. What will you get when you take this course? This particular course will discuss and demonstrate the following art topics: one point perspective, dimension and form, design and layout, sketching, color mixing, outlining, texture and blending, light and shadow, dry brushing and sponging techniques, realistic cracks and brick painting, sky, clouds, hills, trees, foliage and architecture all included in over 2 hours of one on one video lecture as well as written discussion. This course has it all for only $99 US with unlimited access for your entire life! My course can walk you through learning these techniques so easily and the best thing about this course is that you will have a beautiful painting as a product of your hard work that you will be excited to display share with others! Don’t hesitate and think of giving yourself the gift of art today. Click here to view the course now. Want to give this course as a gift? We do offer gift certificates! Click the button below to give this course as a gift.